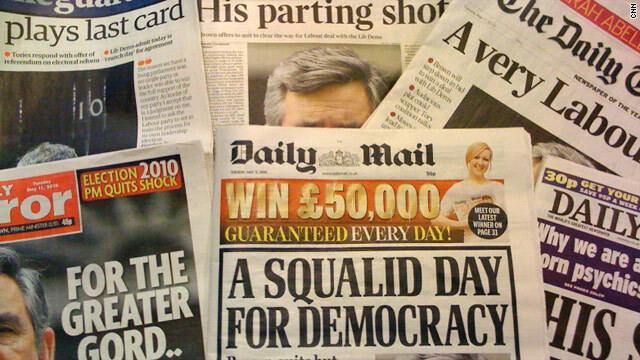 British newspapers respond to Gordon Brown's offer to stand down as Labour leader. The Sun, Daily Mail scathing about Labour plan and Liberal Democrats' "double dealing"
London, England (CNN) -- British premier Gordon Brown's offer to step down as part of a deal to entice the Liberal Democrats into a coalition government with Labour rather than David Cameron's Conservatives provoked a mixed reaction in the UK press Tuesday. In a statement outside Downing Street Monday, Brown announced he would stand down as Labour leader in the autumn and allow a contest for his replacement to begin now. "Gordon Brown at last wielded his great clunking fist yesterday that Tony Blair had predicted would halt the Conservative advance on Downing Street," declared The Times. "After four days of watching a clumsy courtship between David Cameron and Nick Clegg, the Prime Minister timed his announcement to cause maximum trouble." It added that Brown knew his continued occupancy of Downing Street would be an impediment to any hope of Labour remaining in power and that "over the weekend, even his closest allies had privately conceded that there was no real prospect of Brown remaining the Labour leader for long." "Squat a mess," exclaimed The Sun -- an influential tabloid and stable-mate of the Times in the Rupert Murdoch-owned Newscorp empire -- which had switched its allegiance to David Cameron before the election. In a scathing attack, it claimed the "squatter PM's bombshell had plunged the country into deep political chaos -- with no new government now expected for days." The Daily Mail, considered the most right-wing of the major UK titles, described Brown's offer to quit as "a squalid day for democracy," and added that many of Labour's old guard openly condemned the prospect of a "shabby deal with the Liberal Democrats that would deny the keys of Downing Street to David Cameron." "I believe it will lead to a lack of legitimacy, and I think the British people will feel that we have not heard what they said to us," former Home Secretary David Blunkett was quoted as saying. It added that Brown ally Peter Mandelson and Tony Blair's former spin doctor Alistair Campbell were the architects of Labour's "audacious" plan, and accused Nick Clegg and his Liberal Democrat party of "double-dealing" by meeting Labour figures over the weekend despite their formal dealings with the Conservatives. The Telegraph labeled Brown's plan "a very Labour coup" that had outflanked Cameron as he prepared to enter Number 10. It said Labour was attempting to "exploit the Tories' reluctance to offer the Lib Dems far-reaching voting reform." Labour offered to hold a referendum asking voters if they want a proportional representation voting system -- a key issue for the Liberal Democrats. The left-leaning Guardian said Brown's "last card" had panicked the Conservatives into making an "extraordinary" counter-offer to the Lib Dems: a referendum on the alternative vote electoral system and a coalition government with seats for Nick Clegg's party in the cabinet. This "hurried Tory offer, previously seen as completely beyond the ideological pale for the party, was swallowed by shell-shocked Tory MPs," it said. "For the greater Gord," was the effusive response from the Labour-supporting Mirror, as it painted a selfless picture of a prime minister who had "fallen on his sword" for the good of the country.